Toenail fungus is a condition that many people develop and suffer from. Toenail fungus often results in the discoloration and thickening of the toenail, which can cause embarrassment for many people. The condition begins as a small white or yellow growth beneath the tip of the nail and at its worse can develop into the nail’s deterioration. 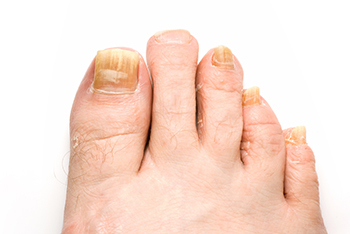 Thick, ragged, and distorted nails lacking shine are a sign of toenail fungus. The color of the affected nail tends to be darker because of debris buildup underneath the nail. Toenail fungus is more likely to develop for people who wear socks and shoes that do not allow decent ventilation of the feet. Public showers, gyms, and swimming pools are breeding grounds for toenail fungus, as their damp and humid environments allow for the growth of bacteria. Patients should visit their local podiatrist if they suspect they have toenail fungus because in its more severe stages, toenail fungus can become very painful. Other infections can develop from toenail fungus that can spread to other parts of the body. Upon examination for fungus, your podiatrist may scrape your nails if he or she finds debris. This will be sent to a lab to determine what fungus is causing the condition. Toenail fungus can also be treated with certain over-the-counter antifungal creams and ointments. To remove pressure from the nails, keep them cut at a short length. Oral antifungal drugs, medicated nail cream, or medicated nail polish may also be prescribed by your podiatrist if simpler treatments do not prove successful. In some cases, your podiatrist may also recommend laser treatment to eradicate toenail fungus.